The anterior cerebral artery (ACA) arises from the internal carotid, at the medial extremity of the lateral cerebral fissure. It passes forward and medialward across the anterior perforated substance, above the optic nerve, to the commencement of longitudinal fissure. 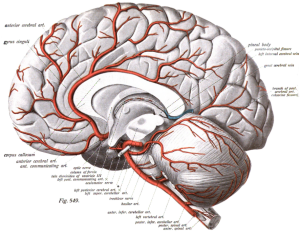 Is one of a pair of arteries on the brain that supplies oxygenated blood to most midline portions of the frontal lobes and superior medial parietal lobes. The ACA has five segments. A1 originates from the internal carotid artery and extends to the anterior communicating artery. A2 extends from the anterior communicating artery to the bifurcation forming the pericallosal and callosomarginal arteries. A3 is one of the main terminal branches of the ACA, which extends posteriorly to form the internal parietal arteries and the precuneal artery. A4 and A5 are the smallest branches and are known as callosal arteries. ACA supplies the frontal, pre-frontal and supplementary motor cortex, as well as parts of the primary motor and primary sensory cortex. ACA infarcts are rare because of the collateral circulation provided by the anterior communicating artery. ACA infarct can present as contralateral hemiparesis with loss of sensibility in the foot and lower extremity, sometimes with urinary incontinence. This is due to the involvement of the medial paracentral gyrus. If the lesion is very proximal, it is possible that there may be cognitive impairment due to lesions in the prefrontal cortex. It`s important to recognise the stroke symptoms and to immediately seek medical assistance. FAST (Face, Arm, Speech, Time) has a Sensitivity of 82% and a Specifity of 83%. Assess for Facial Palsy, Arm Weakness and Speech Impairment. The test is positive if ≥ 1 is present. ↑ 2.0 2.1 Trepel, M. Blutversorgung des Gehirns (Blood supply oft he brain). In: Trepel, M. Neuroanatomie (Neuroanatomy), 5. Edition. München: Urban e Fischer, 2012. P 280-283. ↑ Gbinigie, I.I., Reckless, I.P., Buchan, A.M. Stroke: management and prevention. Stroke, 2016; 521- 530.